SUNRISE, Fla. – Florida Panthers General Manager Jacques Martin announced today that the club has agreed to terms on an entry level contract with D Keaton Ellerby. 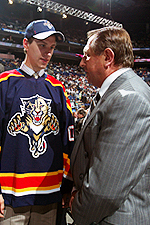 Ellerby, 19, played in 53 games with the Moose Jaw Warriors of the Western Hockey League after being traded from Kamloops, for Panthers prospect RW Brady Calla, 16 games into the 2007-08 season. With Moose Jaw, Ellerby had two goals and 21 assists with a plus-6 rating and 81 penalty minutes. In five playoff games this spring for the Warriors, Ellerby has two assists and 15 penalty minutes. The 6-foot-4, 188-pound defensemen, played for Team Canada at the 2007 Canada/Russia Superseries and was the Panthers first round pick (10th overall) in the 2007 NHL Entry Draft. Sunrise Sports & Entertainment is the premier company of its kind in South Florida. Home to more than 185 events annually and the Florida Panthers Hockey Club, the BankAtlantic Center is consistently a top 15 worldwide venue according to Pollstar. The BankAtlantic Center welcomes more than two million guests each year and is also the home of the Sinatra Theatre presented by BankAtlantic and three publications Unrestricted (South Florida & New York) and Panthers Insider.